This one was super satisfying to check off the list. This is the kind of project that will be ongoing, but getting to a good place with the toy organization feels good. 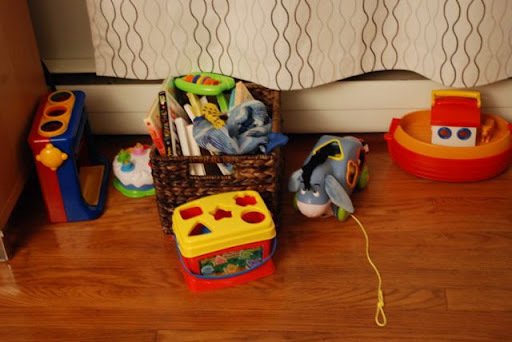 We started out with toys in every little corner of the living room, and Evy would regularly pull every single toy out and then move on to do the same thing in her room. There was too much stuff around for her to concentrate on any one thing for very long, and we needed some order to the situation. We have a small living room that doubles as play room for now. Here’s some ‘before’ shots to set the scene. 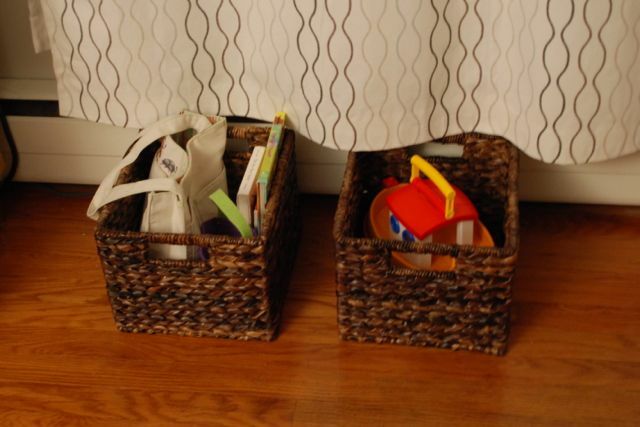 I had attempted some organization with some bins and baskets here and there, but mostly they were crammed with stuff, some outgrown, with no rhyme or reason to where things were. 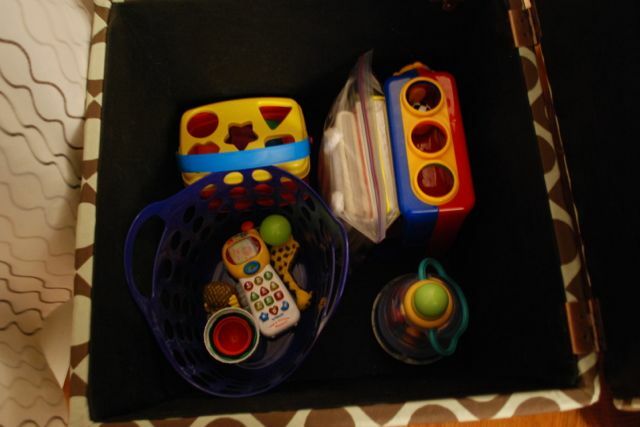 Storage in a small ottoman started out well, and then just became layers and layers of toys, pieces of puzzles, and just another place to hide the mess. 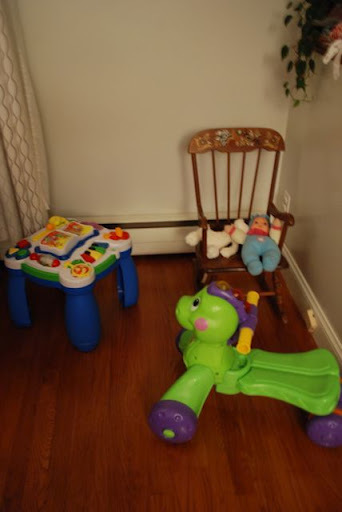 As I talked about in my last post, I wanted to drastically cut down on the number of toys out and visible at any one time, weed out anything that had been outgrown, broken, or should be filed elsewhere, and generally make it a less overwhelming scene for everyone. 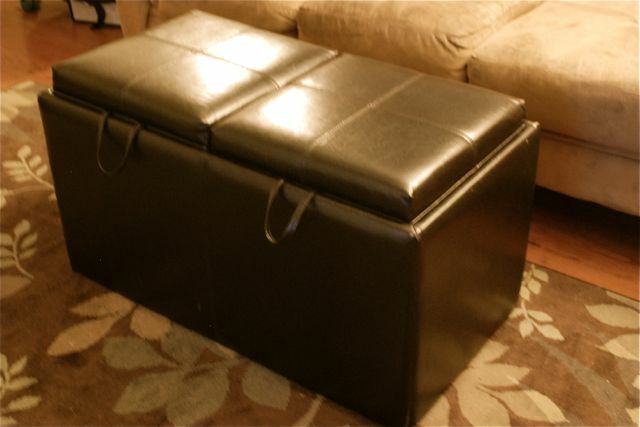 I started by moving the blankets we had stored in our coffee table/ottoman and finding new homes for them. My goal was to stow most of the toys out of site in our two ottomans. 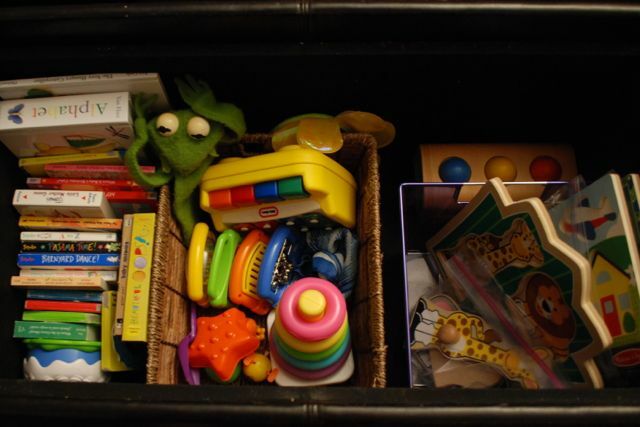 The second step was going through and removing anything that had been outgrown – a tote bag full of rattles, teethers, cloth books, and a couple stuffed animals went to basement storage. I put most of the books from the living room along one side of the ottoman (I left out about five books in various baskets around the living room – we’ll rotate these once a week or so). 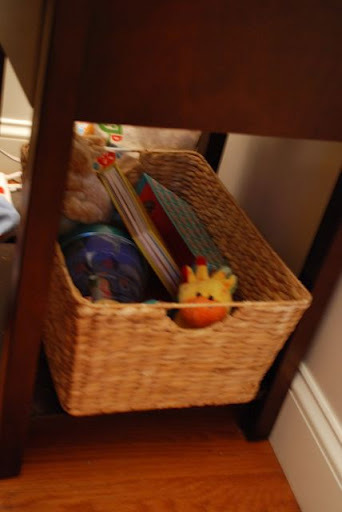 I added a couple baskets to organize things inside the ottoman. 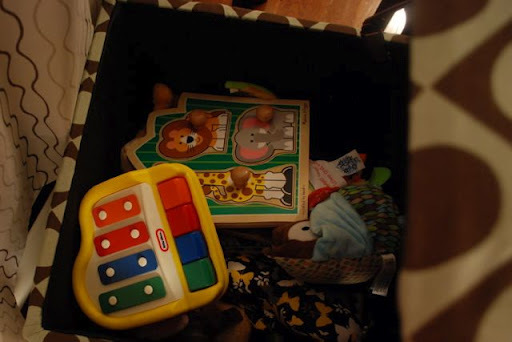 One basket contains the musical instrument-type toys. Another contains puzzles (now in bags to contain the pieces) and a couple of other toys. 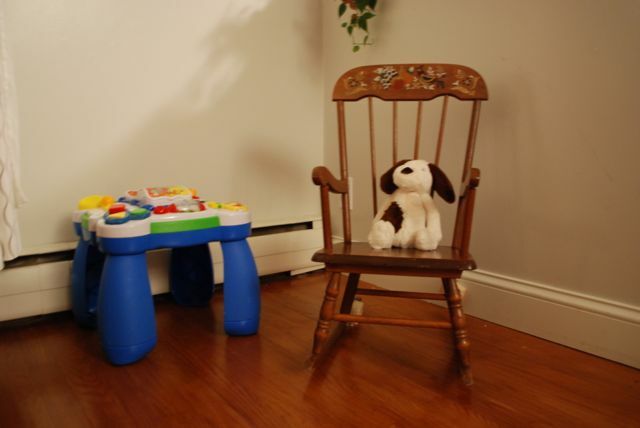 Some wooden toys and puppets take up the remaining space arund the baskets. It’s more organized than this photo lets on, really. 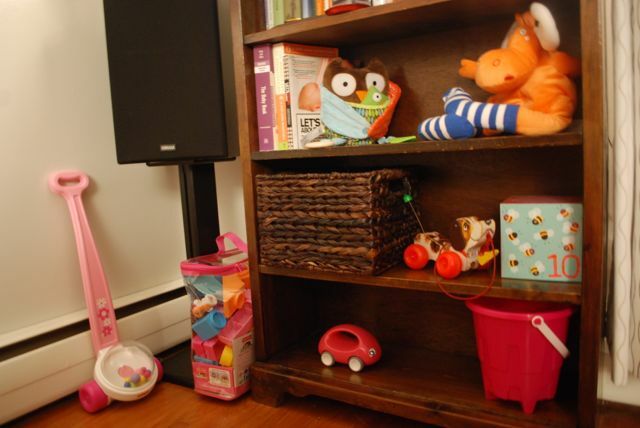 The smaller ottoman, previously crammed with stuff, contains just a few larger toys and a basket with some smaller toys. The plan is to rotate the toys that are stored out-of-sight with the toys ‘on display’- always keeping just a few out for play. Storing toys in the ottomans freed up some baskets. 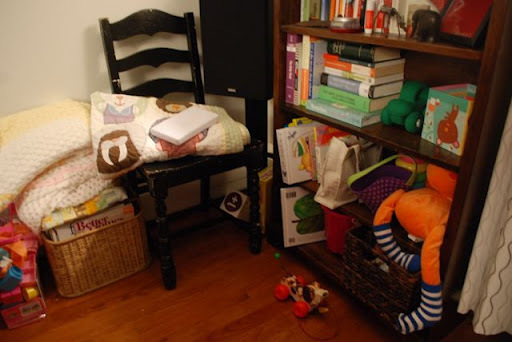 The basket on the left contains a couple books and a small bag of about eight wooden blocks. The other basket contains our Playmobil Noah’s Ark, an all-time favorite. On to the bookshelf. I gave in and moved another stack of our (grown-up, non-board) books to another room. I also moved the extra chair and other clutter out of the corner and into another room (which now needs to be organized, of course). Another basket here contains a couple of board books. Just a few toys are displayed on the shelf (and I may even edit this further). This is the final corner of the room. The table is still a favorite (even without the lights and sounds turned on- phew), so that stays out for now but I anticipate stowing that away in the near future. I felt like I could see a difference in Evy’s play immediately. She played with her blocks for awhile this morning, rather than emptying the bag and moving on. She’s always spent a good amount of time with her books, but today she went back and forth between two rather than twelve. And when we brought her to the living room for clean-up at the end of the day, it was a much quicker process! My remaining challenge here is the stuffed animal situation. Most of them are in E’s room and not the living room, but I don’t know what to do with them, how to store/display them, or how to cull the growing collection. Evy has been gifted some adorable stuffed animals, and she has a couple favorites, but the giant teetering pile in her room isn’t in line with the toy streamlining we’re working on. She doesn’t really play with them, and they are very hard to store. I really don’t know what to do about that one. I guess that’s a project for another week!